VAD members contributed to the care of sick, wounded and dying soldiers during both World Wars. Primarily women, they assisted convalescent soldiers in Canada and worked in British hospitals overseas. Organized through St. John Ambulance, which was once based here, and the Red Cross, VAD provided thousands of women volunteers one of the few routes to active war service before the creation of women's auxiliary services in the military in 1941. 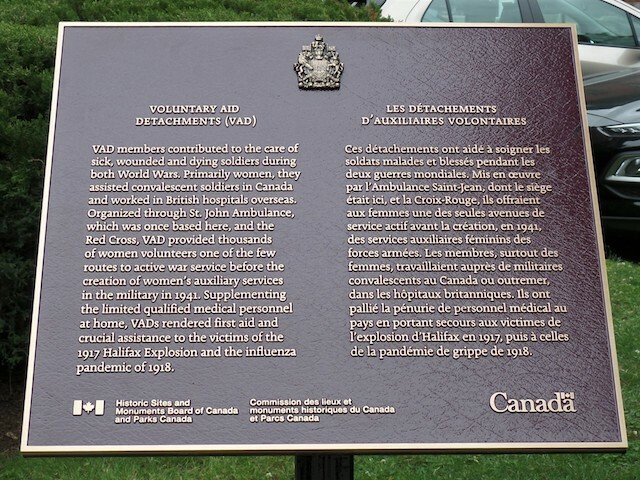 Supplementing the limited qualified medical personnel at home, VAD's rendered first aid and crucial assistance to the victims of the 1917 Halifax Explosion and the influenza pandemic of 1918.